My questing this week was relatively light once again :(. This was because of a few work related activities that kept me from logging in on Wednesday and Thursday. Wednesday night is also my weekly date night with my wife so I don’t log into the game for a typical night run but I usually get a chance to run a slayer prior to dinner. This week though, an ex-coworker of mine retired and his retirement party was on Wednesday and Thursday I was traveling all day and was just too tired to log in. But, I did get some questing in during the rest of the week. 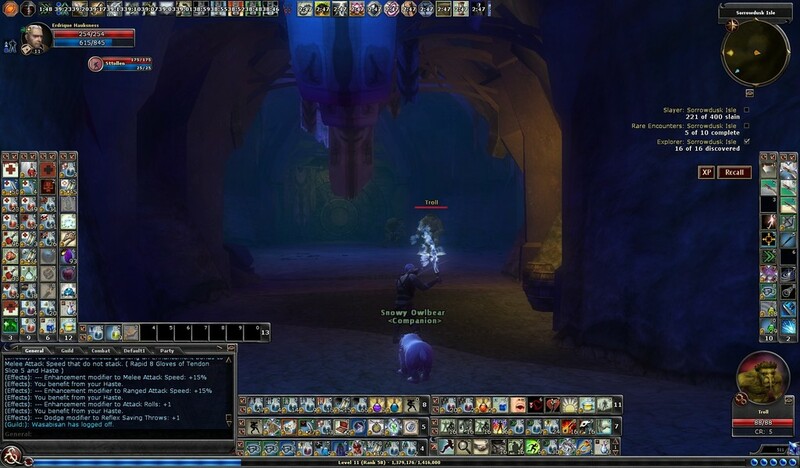 On Sunday, I logged on with Kanndar (Level 14 Paladin) and I took him into the Ruins of Threnal. I was running a little short on time and decided to go ahead and complete the set of quests known as the Giant Caves: The Giants’ Lair, The Giants; Supplies, and The Giant Lieutenants. During these runs, Kanndar picked up a monster manual deed for hill giant hunter which netted him 1,179 experience. Kanndar facing off against the fire giants in the fire caves. Kanndar battling the giants on his way to destroy some crates. Kanndar fighting against a champion in the Giant Caves. Monday, I took Hamllin (Level 20 Fighter/Fatesinger) into the Ruins of Gianthold (Heroic) while I was playing during my weekly digital pen and paper session. Hamllin collected 80 Storm Fist slayers, 99 Storm Heart slayers, and 116 Storm Eye slayers. He also came across the rare encounters Zakaya Master Ragath, Expedition Leader Brazwold, Tarmer Stonehoof, Lord Cirrus, and Clan Chief Ogh. Hamllin hunting down some fire giants in Giant Hold. I started off on Tuesday by dual boxing with Crawlller (Level 8 Ranger) and Cannock (Level 8 Druid) and did a slayer run in Three Barrel Cove. They collected 104 slayers during that run and came across the rare encounters for Strinati, Dybesh Relix, Chortle, Brine, and Ithun Orenah. After that run, I logged on with Erdrique (Level 11 Bard) and Sttollen (Level 12 Rogue) and I took them into the quest Stromvauld’s Mine. 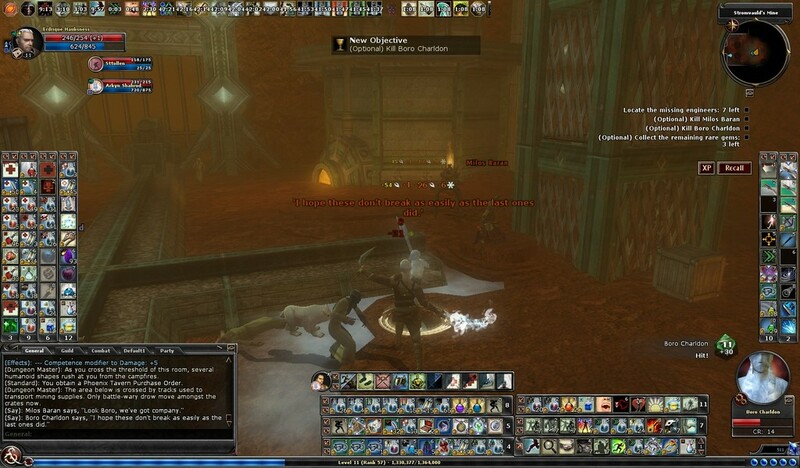 While in there they completed the optional objectives to slay Milos Baran, Boro Charidan, and Degren Marzat. For my nightly run, I logged on with Charlock (Level 16 Fighter) and I was joined by Hellfiend and we decided to tackle the Slave Pits of the Undercity on heroic elite. Charlock collected two monster manual deeds, one for ghast hunter (9,439 experience) and one for rat hunter (1,887 experience). I’m still learning that quest and so is Hellfiend so it isn’t too surprising to learn that we got roasted in the massive fire trap room. So we didn’t get the quest completed but we’ll knock it out next time. Crawlller battling Brine in Three Barrel Cove. Erdrique defeating the drow of Stromvauld’s Mine. Charlock preparing to deal with the slavers. Friday night, I logged on with Erdrique and Sttollen, once again, and this time I took into the Xorian Cipher. To get to the Xorian Cipher, I first completed The Path to Madness on elite and in so doing, Erdrique collected nine mysterious remnants. While in the Xorian Cipher, Erdrique picked up a monster manual deed for scorrow hunter for 2,260 experience. Erdrique and Sttollen completed the optional objectives for finding and entering the vault, sealing all of the rifts, and taking out Deathfang, Mastart Markud, Urtyan Markud, and the Vault Guardian. In the vault, Sttollen picked up a mythic version of the Chaosgarde and a Reaver’s Ring. Meanwhile, Erdrique picked up a Planar Gird and a mythic version of the Chaos Band. Erdrique also collected 12 mysterious remnants. Erdrique slicing through the path to Xorian Cipher. Battling the undead of the Xorian Cipher. To close out the week, Erdrique and Sttollen started things out by dual boxing Sorrowdusk Isle. They collected 114 slayers and they both hit the 200 slayer mark as well as finding the rare encounters: Saate, Thanolin, Barxer, and Noozer. A little while later, I logged on with Kolll (Level 22 Ranger/Shiradi Champion) to get the data I need for my monster manual analysis but after I did that, I took him out into Tangleroot Gorge because I still have yet to finish that explorer are for him. While out there, Kolll picked up a monster manual deed for wolf exterminator II and received 1,650 experience. He also took out Gharjat, Jarak, and Silkweave. 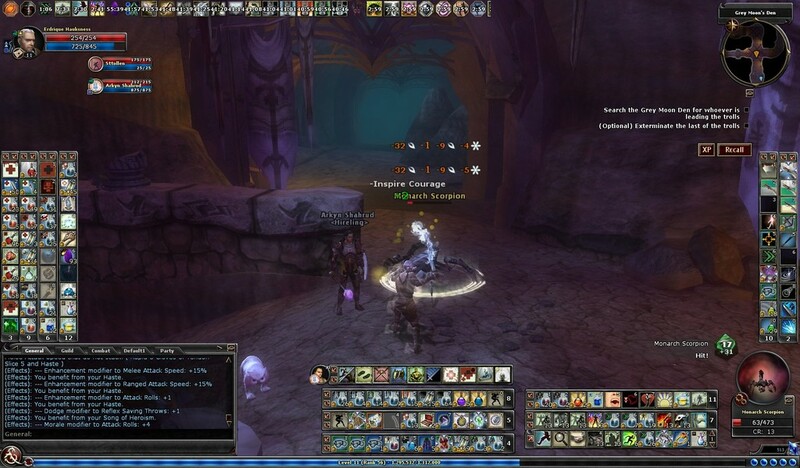 Later on Saturday night, I logged on with Erdrique and Sttollen again and I was joined by Sornea. I have been trying to get some help with the Temple of Elemental Evil Part 1 and this time I had it :). So we headed to the Hall of Heroes and then to the Temple. Erdrique picked up another monster manual deed, this one human exterminator III for 1,695 experience. He also picked up 27 mysterious remnants. We had a few deaths but we did complete the quest and completed the optional objectives for 10, 25, 50, 100, and 200 slayers. After that we called it a night. Erdrique making his way through the caves of Sorrowdusk Isle. Kolll getting reacquainted with Tangleroot Gorge. It is time to go hunting in the Temple of Elemental Evil. So overall the week was a little shorter than usual but still productive. I was really grateful for Sornea’s help in getting through the Temple of Elemental Evil. Now all I need to do is get through the second part :). 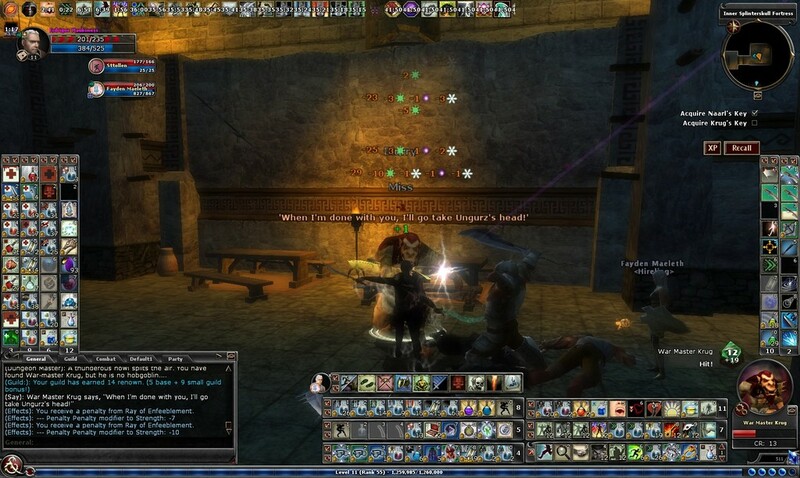 Thanks for reading everybody and happy hunting in DDO!! I wound up obtaining a new milestone relatively recently which resulted in me getting a new cosmetic pet. The other day I was taking Erdrique (Level 11 Bard) and Sttollen (Level 12 Rogue) into the Searing Heights to work on that explorer area. As I made my way through the Sulatar encampment I took out a few fire elementals and then took note that I had obtained the second level of fire elemental expertise in the monster manual. That particular rank awards you with a new cosmetic pet. Erdrique picking up a new monster manual deed reward. The award you get is for blue fire elemental creature companion. I think this will be the perfect little pet for Cantlin (Level 13 Sorcerer). Now time to get the next award!! So far, I have taken a look at my monster manual statistics for my account as a whole (Part 1 and Part 2), specifically for Erdrique (Part 3 and Part 4), and specifically for Hamllin (Part 5 and Part 6). Now, I want to take a look at the same trends and analysis for another of my characters, Kolll. Kolll is a first life Ranger, who primarily focuses on the Arcane Archer enhancement line and is currently working his way through the Shiradi Epic Destiny. One immediate thing that is clear when looking at the statistics, Kolll doesn’t account for nearly as much as the overall monster kills as Erdrique and Hamllin. This is primarily simply due to time constraints. Although I really enjoy playing Kolll, he just doesn’t get the same amount of playing time as Erdrique or Hamllin. All told, Kolll has taken down over 5,300 monsters/enemies. This accounted for just about 1.5% of all of my enemy kills on my VIP account (Table 1 and Figures 1 and 2). Taking a look at Kolll’s statistics by monster type, it looks like the enemies that accounted for Kolll’s most kills were humanoids, player races, monstrous humanoids, vermin, and undead. Although not in the same order, these monster types are also the top five across my account. Kolll accounted for just about 1 to 2% of the total number of monster kills for these top five monster types across my entire account. Kolll has accounted for a higher percentage of kills in outsiders and constructs than in the some of the other monster types. This is primarily due to when monsters in those types were added to the monster manual and the timing of the quests that Kolll was (and is currently) making his way through. For instance, Kolll was making his way through the epic versions of the Vault of Night and the Sands of Menechtarun when some of the various constructs and outsiders were added to the monster manual. Table 1. Number of kills by monster type for Kolll and my VIP account and the percent of kills attributed to Kolll. Figure 1. Distribution of Kolll’s monster kills by monster type from the monster manual. Figure 2. Kolll’s and my account monster kills by monster type for those in the monster manual. Monsters in the volumes of the Prologue, Volume 1, and Volume 2 accounted for the top three most monster kills for him. Monsters that were added with Volume 5 ranked fourth for Kolll. I don’t find this too surprising and these trends are similar to what I have seen with Erdrique and Kolll. One thing I also noted was that Kolll had more monster killed from Volume 7 then in some of the earlier volumes. This is all due to the fact that Kolll is running quests that contain more of the monster/enemy types that were released in Volume 7 then some of those earlier volumes. Table 2. Total monster kills for Kolll and my VIP account by monster manual volume. 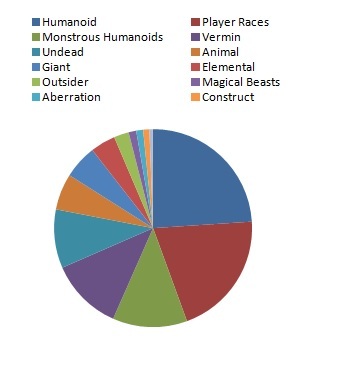 The monster races that accounted for the majority of kills for Kolll are listed in Table 3. The monster race that Kolll accrued the most kills for were humans and his efforts accounted for over 1.4% of my VIP account. Other monsters that were in Kolll’s top ten of most killed included spiders, gnolls, and hobgoblins. Looking at the percent of the monster kills attributed to Kolll, it is interesting to note how he accounts for a large percentage of the kills for dretch, bears, and draegloth (Table 4). These monsters just happened to be added to the monster manual while Kolll was working through quests that contain them. Table 3. 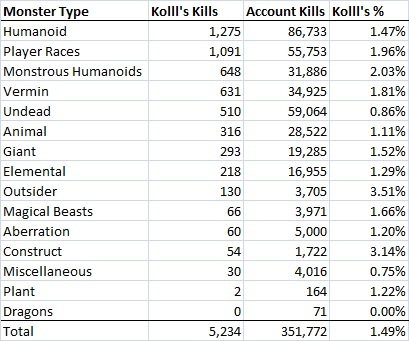 Total number of monster kills for Kolll’s top ten, both for him and account wide, and the percent he accounted for. Table 4. Top ten monster kills by percent contribution from Kolll account wide. Excluding the monsters that Kolll hasn’t had any kills of, the monsters that Kolll has the fewest amount of kills are presented in Table 5. The majority of these monsters happen to be in quests that Kolll isn’t making his way through. However, I expect this to change. Kolll still needs a large number of quests to complete as favor runs. As he makes his way through those quests, he’ll encounter the monsters in these earlier volumes and will build up those statistics. Table 5. Number of monster kills for the races that accounted for the fewest number of kills for Kolll and account wide and the percent Kolll accounted for those kills. One thing these trends show is the smaller impact Kolll has had on my monster manual statistics account wide. However, even though Kolll hasn’t contributed to a significant portion of my account’s kills, he has contributed to a large percentage to some specific races. These are primarily due to timing of monster manual releases and the quests he is actively running. Thanks for reading everybody and happy hunting those monsters in the monster manual!! My quest runs this week included some runs across a mulitude of levels, as well as various outcomes. To kick the week off, I logged on with Harrgon (Level 11 Favored Soul) and Suppply (Level 11 Paladin) and I took them into The Grey Moon’s Den: The Trollish Scourge. On the way to the quest, they both collected 11 slayers for Sorrowdusk Isle. Once I made into the quest I ran into some difficulties while playing Harrgon. Harrgon was ripped apart five times by various champions. It really emphasized how under geared he really is and I will need to work on that. Hopefully I can rebuild my stock of essences and have Erdrique (Level 11 Bard) craft Harrgon some equipment. In the end, I had to have Suppply bail out Harrgon but I was able to get the quest completed. They also took out Shaman Herpostaw as well as all of the ogre collaborators. On Monday, I logged back on with Suppply and Harrgon and took them back out into Sorrowdusk Isle for some slayers while I was also playing my weekly digital table top game. While hunting in Sorrowdusk Isle, they collected 270 slayers out there. Harrgon hit his 750 slayer mark and Suppply picked up two monster manual deeds, spider (1,200 experience) and scorpion (1,500 experience) exterminator II. They also defeated the rare encounters Saate (2), Vermilo (2), Teargon, Kremen, Kurmer, Furley, and Noozer. Harrgon was also able to finish collecting all rare encounters as well. Suppply hunting in Sorrowdusk Isle. I logged on Larrs (Level 21 Bard/Fatesinger) and I took him into the King’s Forest for some slayers. While out there, he defeated two dire bears, one drow priestess, and came across the random encounters for the Knight’s Plight and Knight’s Collar. He also picked up a purple dragon knight commendation and 46 slayers. Shortly after that run, I logged on with Hamllin (Level 20 Fighter/Shadowdancer) and I decided to try The Devil’s Details on heroic elite. It has been quite a while since I have ventured in here and I was rudely awaken by the onslaught of abishai as I made it further into the quest. Needless to say I wiped in dramatic fashion. I will have to try to get my revenge later. Later that night, I logged on with Kolll (Level 22 Ranger/Shiradi Champion) and I took him into the quest Impossible Demands on epic hard with my new lioness and my onyx panther and owlbear. Although Kolll suffered a few defeats, he did complete the quest and picked up 16 commendations of valor as a quest reward. Kolll also picked up seven slayers in the King’s Forest as his way to the quest as well as the random encounter Money and Life. He completed the optional objectives for saving the hostages, defeating Warleader Speitar and slaying the spider pet Akorstra. I still had some time left, so I did a quick favor run with Kolll and ran through the Sacred Helm before calling it a night (picked up the Cloven-Jaw Longbow for the effort). Larrs hunting in the King’s Forest. Hamllin coming across a puzzle in the Devil’s Details. Kolll making his way through Impossible Demands. During Wednesday, I logged on with Containment (Level 8 Cleric) and Cannock (Level 8) Druid and I took them into Three Barrel Cove for some daily slayer action. They collected 186 slayers which included Ilmarin Tychoon, Ithun Orenah, Vitia, Dulse, Dybesh Relix, and Strinati. Containment also hit the 500 slayer mark and found a few more explorer points. After that run, I logged on with Erdrique and Sttollen (Level 12 Rogue) and I took them into the Grey Moon’s Den: Extermination. On the way to the quest, they picked up 11 slayers. They also completed the optional objective for slaying Blizzard and all of the trolls. Erdrique also picked up a monster manual deed for ooze exterminator IV (account award) while Sttollen picked up a monster manual deed for human expertise (account award). That was all I was able to get through on Wednesday as I spent the rest of the night with my wife for our weekly date night. Containment taking in the bell tower in Three Barrel Cove. Fighting the scorpions in Grey Moon. For Thursday, my single quest run consisted of another dual boxing episode with Charlock (Level 16 Fighter) and Stoorage (Level 15 Fighter) who both ventured into the Red Fens. While out there, Charlock collected 104 slayers while Stoorage collected 107 slayers (with a minor slayer potion). They also came across Crooktooth, Kar Xyr, and Nab Ren. Charlock hunting down the enemies in the Red Fens. Friday, I kicked things off by dual boxing with Lorrikk (Level 13 Monk) and Stoorage and entered the Red Fens for some slayers. They both collected 117 slayers and came across Mudfoot, Fencreeper, Kar Xyr, Nab Ben, Sharkbiter, and Gorger. Lorrikk also picked up a monster manual deed of monstrous plant exterminator (1,100 experience). 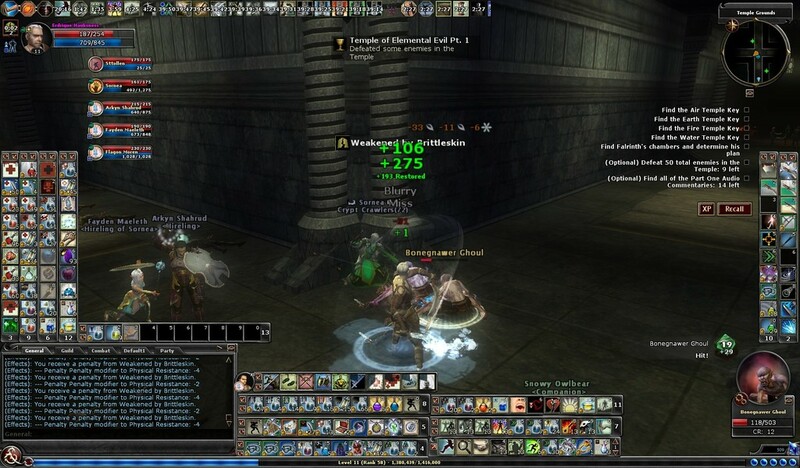 Later that night, I logged on with Erdrique and Sttollen and I took them Free Delera on elite. They completed the optional objective for slaying the soul lock guardians. Erdrique picked up 26 mysterious remnants while Sttollen picked up 12 mysterious remnants. 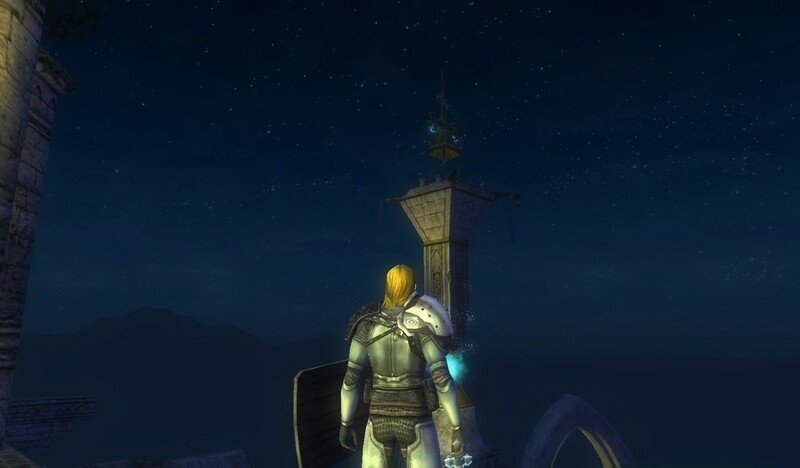 I then took Erdrique and Sttollen out into Searing Heights for more slayers. They picked up 103 slayers and both hit the 750 slayer mark. They also defeated Guck, Calcine, and Hazai Haatha. Erdrique also picked up the monster manual deed for wolf exterminator IV and picked up another 3,390 experience. Lorrikk hunting in the Red Fens. Erdrique battling a skeleton in Free Delera. Erdrique coming across Guck in the Searing Heights. To close out the week, I logged Erdrique and Sttollen during the mid-afternoon and I took them into the Searing Heights in hope to find their last rare encounter. After a few attempts I finally came across the last rare encounter for them, Smolder. They also came across and defeated Giallo and Ghamzee. In doing this, Erdrique also picked up monster manual deeds for drow exterminator II, fire elemental exterminator II, fire elemental hunter, and fire elemental expertise II. As a result, Erdrique picked up the fire elemental creature companion 🙂 and he and Sttollen completed the Searing Heights. Needless to say it was a busier week than the week prior and just as diverse. Erdrique and Sttollen are now going to finish making their stamp in Sorrowdusk Isle. We’ll see what the rest of the new week has for me!! Thanks for reading everybody and happy hunting!! 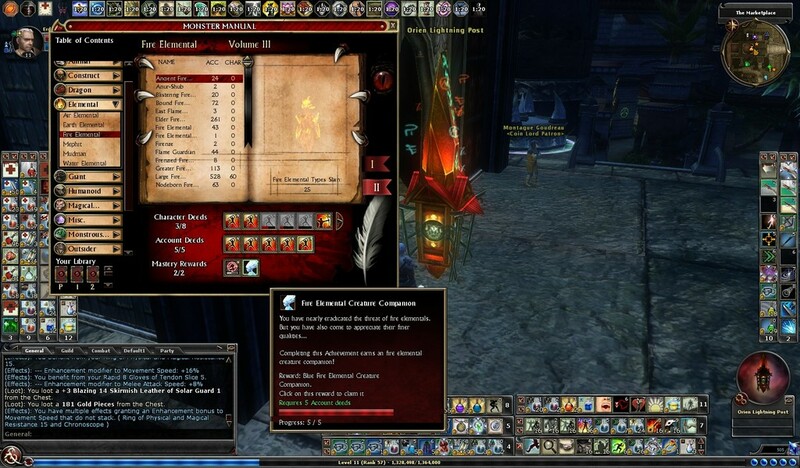 There are a large number of feats in DDO, especially for those who like to engage in melee combat. A few of these melee feats are handed out to all characters during the creation process, with one of these being Trip. To a melee combatant, the trip feat can be extremely useful. By building up your trip ability, a melee character can use trip as an effective crowd control mechanism, especially if you don’t have an arcane or divine caster to help stop a crowd of enemies in their tracks. The difficulty check for a trip attempt is based on 10 + strength modifier + enhancements + vertigo bonus against an enemies strength or dexterity saves. If a creature is tripped and subsequently knocked down, they can then make a balance check to get back up after a short period of time. Naturally, the higher the strength score you have the more likely you will be able to trip an enemy. Barbarians, fighters, and paladins are more likely to use this type of attack and this can be especially useful against enemy spell casters and brutes that can do a large amount of damage over a large area. There are a number of things that can increase your trip ability and difficulty check besides increasing your strength score. One of these is by taking the Improved Trip feat. The improved trip feat adds +4 to the difficulty check to knock down an enemy and to keep him down. However, one issue with taking the Improved Trip Feat is that you have to take Combat Expertise as a pre-requisite. And to take Combat Expertise, you need to have a intelligent score of 13, which could be an issue for a melee class which tends to spend their attribute points in other areas (strength, constitution, dexterity). Suppply tripping an ogre in Sorrowdusk Isle. Another way to increase the effectiveness of the trip attack is through various enhancements. In particular, those in the fighter trees such as Alacrity and Tactics from the Kensai and Last Stand from Stalwart Defender increase the difficulty checks for all of your combat based attacks. Other ways to increase your trip ability is to equip some gear that promotes a vertigo bonus. Although the majority of trip attacks are based on your strength as a major portion of the character’s difficulty check there is at least one character class and enhancement line that uses dexterity instead of strength for its trip difficulty check with a special attack. The special attack that I’m talking about is Sweeping Strikes from the Rogue Thief Acrobat line. This special attack uses a difficulty check equal to 10 + rogue level + dexterity modifier as long as the rogue is equipped with a quarterstaff. This attack is also special in that it is a cleave attack meaning that it can trip numerous enemies that might be surrounding the rogue. Overall, trip is a pretty fun ability. I try it use it as much as I can with my appropriate melee characters. Thanks for reading everybody and happy hunting!! There are quite a number of epic level quests now, with that number first expanding when the Menace of the Underdark Expansion was released. One of these earlier quests is called Impossible Demands. Impossible Demands is a level 21 quest on epic normal. The quest giver is Helena Falagon who is located in Eveningstar. This quest is typically the first quest for the Darkening Story Arc, which also includes the Unquiet Graves, the Lost Thread, and the Battle for Eveningstar. Impossible Demands is located at the Middler Farmhouse which is located a short distance into the King’s Forest, basically in a small fringe village on the outskirts of Eveningstar. When you talk to Helena, she tells you of the various raids that have occurred on the outskirts of Eveningstar and how it appears that one family is currently being held hostage. The family is being held up in their farmhouse in the King’s Forest by a small, but extremely powerful, contingent of drow forces. It is hoped that we can rescue all of the hostages and to defeat the drow forces. The Middler Farmhouse is just a short distance down the path from Eveningstar within the King’s Forest. It is likely that you will encounter a few drow on your way but there is a shrine nearby if you need to use it. From the outside, you can see that the farmhouse is at least two stories high and fairly large in size. Once you enter the quest. the first thing you notice is the shrine just inside the doorway. The next thing you notice is an injured purple dragon knight being interrogated and tortured by a drow priestess, Vicala Szind. After the brief encounter, you are prompted to talk to the priestess where you learn that she is holding the family hostage and that she hasn’t killed them yet and that she is holding them to learn about the “Thread.” After the set of conversations you then are forced to battle her. As soon as you knock her health down to certain point, she sacrifices the purple dragon knight and regains all of her health and threatens you to leave before she comes back. She then leaves the room to patrol the rest of the house. You are then prompted to talk to the purple dragon knight where you learn that Vicala has the ability to steal the life force of her prisoners and forces. You also learn that their is a family of 10 in the house hold. Before succumbing to the dark magic, the purple dragon knights also tells you that if you head back to the door that Vicala will let you go. He also asks for you to give Vicala the justice she deserves. The Middler Farmhouse is bigger in the inside than the outside dimensions would suggest. The main living room has a few doors that split off in different directions that have stairs that lead to the second floor. The upstairs rooms hold some hostages as well as some of the drow forces. There are also a few traps in the halls upstairs, in the form of spell wards. Vicala slowly makes her way around the upper levels and then back to the lower levels. There are a few optional objectives that require the rescuing of hostages without Vicala noticing them. To complete these objectives you have to slay the drow guarding them as well as timing their release with Vicala’s path. If Vicala sees them during their escape, she will hunt them down and sacrifice them. If you happen to do the quest on casual or normal, you can see Vicala on your map as she makes her rounds. On hard and elite, you have to listen to the dungeon master cue’s to time her progress. To set the prisoners free, you simply need to talk to them and order them to leave immediately. One thing to keep in mind, the prisoner’s will head for the closest staircase to make their way out. So make sure the path is clear before you set them free. The most difficult prisoner’s to free are those in the northwest portion upstairs and those in the basement. In one of the rooms, there will be an optional encounter with a red named drow warrior, Speiter Dun’Robar. Being from House Dun’Robar, he is quite a heavily armed and efficient fighter. There is also an invisible door in the northwest upstairs room that will lead you to a path to Vicala’s pet spider and another optional encounter, Akorstra. Kolll taking on Vicala’s pet in Impossible Demand. At any point, if Vicala see’s you, you can run back to the beginning of the quest, like the purple dragon knight mentioned, and Vicala will back off and let you go. Sometimes this takes a little while for her non-combative AI to take effect, but it does eventually and she stalks away. So keep this in mind if you need to retreat. To make things as easy as possible it is best to wipe out all of the drow forces before you fight Vicala at the end. That way she won’t be able to steal their life force. If you are a stealthy character, this quest is very favorable to those types of techniques. Overall, Impossibles Demands is a different type of quest. To do it successfully, you need to employ some stealth, some heavy and quick combat, and some tactics. It is a relatively short quest, with the longest portions of the quest requiring you to wait on Vicala to complete her rounds. If you are looking for a different style quest, Impossible Demands suits that role and is a fun one to work your way through!! 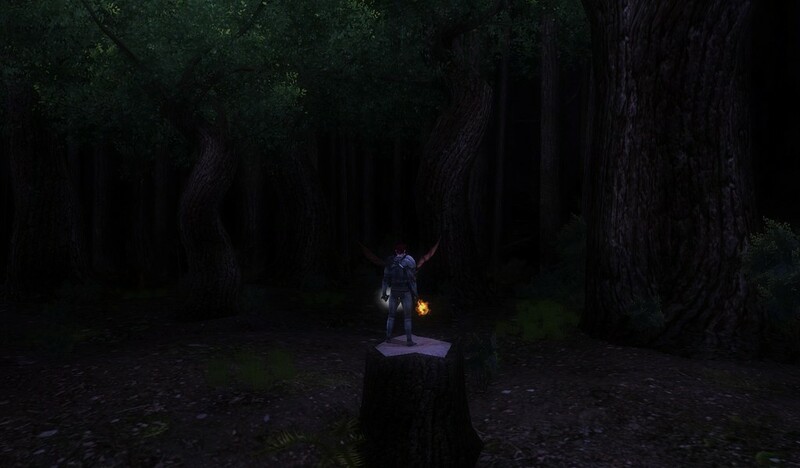 Thanks for reading everybody and happy hunting in the King’s Forest. Taking a look back at my quests this week, I realized that it was a lighter than normal week for me. I didn’t kicked off my quest runs until Monday. I started out with a slayer run where I took Kanndar (Level 13 Paladin) and Stoorage (Level 15 Fighter) into the Red Fens for some slayers during one of my many dual boxing efforts. During that run, Kanndar picked up 99 slayers while Stoorage collected 123 (Stoorage was running a minor or a lesser slayer count boost). They also came across the rare encounters: Kar Xyr, Vyx Ka, and Gorger. Shortly after that run, I logged on with Hamllin (Level 20 Fighter/Shadowdancer) and I took him into the quest Demon Assault on heroic elite. In the past, I have had a number of difficulties in here, even at level 20, because of my cleric hireling being just swarmed. In this run, I actually did complete it however it was pretty rough. I suffered eight deaths and had to re-enter twice. But it is now done!! I also picked up a monster manual deed for Glaberzou hunter. To close out the night, I logged on with Crawlller (Level 8 Ranger) and Cannock (Level 8 Druid) and I thought them into Three Barrel Cove for some simple explorers, slayers, and rares because I was also playing our digital table top game. They both picked up 230 slayers with Crawlller hit his 750 slayer mark. They came across the rare encounters for Ilmarin Tychonn, Ithun Orenah, Vitia, Thrum, Brine, Dulse, and Strinati. Cannock looted the Sky Pirate’s Dagger during that run. I called it a night after that. Kanndar battling Gorger in the Fens. Hamllin having some issues in Demon Assault. Crawlller taking on the horrible scene in Three Barrel Cove. I logged on Harrgon (Level 11 Favored Soul) and Suppply (Level 11 Paladin) and I took them hunting into Sorrowdusk Isle. They collected 116 slayers and Harrgon picked up the rest of the explorer points. They also came across Barxer and Saate. After than run, I logged on with Erdrique (Level 11 Bard) and Sttollen (Level 12 Rogue) and I took them into Tangleroot Gorge and completed the Assault on Splinterskull story arc by completing The Last Move: The Way to Yarkuch and The Last Move: Yarkuch’s Last Stand. I completed the optional objective for slaying Warmaster Muurj. To close out the night, I logged with Larrs (Level 21 Bard/Fatesinger) and I took him into Tomb of the Wizard King on epic normal. Larrs picked up a monster manual deed for clay golum hunter (2,350 experience) and he also picked up scrolls for the Mummy Wrappings and Dustless Boots. He also collected 52 fragments of the Token of the Twelve and received 11 commendations of valor as a quest reward. He also completed the optional objectives for slaying all of the guardians, the eternal gatekeepers, and breaking into the vault. Erdrique dealing with the hobgoblins on his way to fight Yarkuch. Erdrique battling the war master to get to Yarkuch. Larrs fighting his way through the gnolls in the Wiz-King. I didn’t log into game again until Thursday when I dual boxed with Cantlin (Level 13 Sorcerer) and Stoorage and took them into the Red Fens for some slayers. Cantlin picked up a monster manual deed for sahaugin exterminator (353 experience) and hit the 100 slayer mark. Cantlin picked up 61 slayers while Stoorage received 76. They also came across Sharkbiter, Beacon, and Riptide. I then logged on with Erdrique and Sttollen and dual boxed again and took them through The Grey Moon’s Den: The Trollish Scourge. They collected nine slayers on the way to the quest and Erdrique picked up two monster manual deeds: troll exterminator I (423 experience) and troll hunter (2,034 experience). They also collected the optional objectives for defeating all of the ogre collaborators and Shaman Herpostaw. I didn’t get a chance to log in that night and didn’t log back in until Saturday. Cantlin sending some scorching rays at his enemies in the Fens. Erdrique taking note of a black sun ogre in Grey Moon. On Saturday, I spent quite a bit of time working on some Cannith Crafting with Erdrique. By the time I was done, I only had enough time to run one quest. So I logged on Sttollen as well and took them both into Gwylan’s Stand on elite. They made it through the quest without any issues but they only picked up one optional named monster: Maneater. Sttollen did pick up the Roguebane Breastplate and they both picked up Gwylan’s Blade. Erdrique fighting his way through Gwylan’s Stand. So overall it was a lighter week but the spread of quest runs was nice. Had some runs through a few explorer areas, an epic quest run, and some more quests for Hammy and Erdrique. Now time to move onto next week :)!!! Thanks for reading everybody and happy hunting! !